Until recently, I only knew a macaroon to be a big chewy coconut cookie. However, I discovered a very different type of macaroon when my friend Jojo took us to a bakery in San Francisco called Miette. What they called a macaroon looked to me a lot like a meringue. I have never been fond of meringue, so I wasn’t attracted to these cookies. But, the friendly lady behind the counter offered me one to sample. Oh boy! These were no puffy air-filled balls of sugar! They had a chewy almondy texture and a rich flavor. And the bakery had so many different types to choose from! 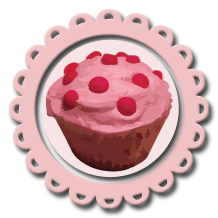 Besides tasting good, these little treats were sooooo cute that I was determined to make some for myself. In doing research on the french macaroon, I learned how finicky the batter is and how easy they are to mess up. I also learned about an italian method which involves heating the ingredients before baking them. I read that the french method is easier to learn, so I went with that. They are actually pretty easy to make if you take your time and pay attention to the details. They have remarkably few ingredients and don’t take long to assemble. I decided to go basic with my first recipe and found a plain macaroon shell with a raspberry white chocolate filling recipe in Desserts Magazine. These cookies turned out to be really cute, but a little too sweet for my taste buds. Both the cookie and the filling were a little on the sweet side. They also didn’t taste as almondy as I would have hoped. So, if you like sweet meringue and sweet berry filling, this recipe is a good one. They turned out beautifully and so adorable! I think I’ll keep searching though for that amazing confection made by Miette. 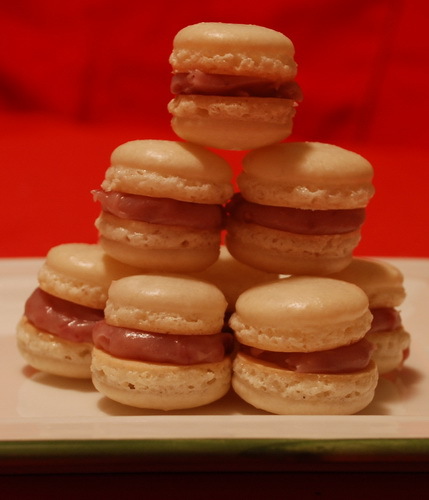 This recipe makes approximately 50 1 1/2 inch macaroons. Beat the egg whites in a stand mixer with a whisk attachment until foamy. Gradually add the sugar and beat until it is glossy and stiff peaks form, set aside. Blanch the almonds by dropping them in boiling water for one minute, draining, and then rubbing off the skins. Grind the blanched almonds and the powdered sugar in a food processor until fine. Pour the almond mixture into the egg white mixture and fold together. Stir quickly at first and then slow down, for a total of no more than 50 strokes. Fill a pastry bag with a 1 1/2 inch tip with the batter and pipe small rounds of batter onto the cookie sheets. Let the macaroons sit out for an hour to harden their shells. Bake the macaroons for 10-12 minutes. Cool for 5 minutes on the cookie sheet and then carefully peel off the parchment paper and allow to cool on racks. Heat the heavy cream in a medium pot on the stove until hot. Stir in the white chocolate and jam and mix until well combined. Put in the fridge until cool enough to spread onto cookies. Pipe or spread filling onto the flat side of each macaroon and top with another macaroon. This entry was posted on Tuesday, December 23rd, 2008 at 10:41 pm	and is filed under Cookies. You can follow any responses to this entry through the RSS 2.0 feed. You can leave a response, or trackback from your own site. The macaroons remind me of the little burgers that Popeye’s friend used to bargain for on the old cartoon! Are you old enough to remember those, Kricket? I am making the ginger stars for a party on Saturday night. Yum and so pretty.